When I was offered a copy of Baking for Friends by Kathleen King of Tate’s Bake Shop in Southampton, NY, I hesitated. Even though I love baking for friends, especially during the holidays, those gorgeous cookies on the cover didn’t really scream “diabetic-friendly” to me. Then I learned the book had an entire chapter devoted to “health and lifestyle baked goods.” There are recipes for banana muffins with whole wheat flour and flaxseed, vegan “scuffins” (somewhere between a muffin and a scone), a chocolate pie that won an American Heart Association Heart-Healthy Bake-Off plus several gluten-free delights. I decided to take a chance that there would be diabetic-friendly recipes in the book. When I saw the photo of the Da Bonac Bowls, I knew what I was going to try first. 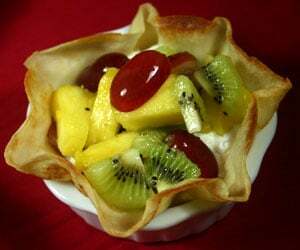 This is essentially a crepe molded around a bowl to form a basket that is then filled with whipped cream and fruit. A group of students from East Hampton High School (“The Bonackers”) submitted this prize-winning recipe to a healthy snack challenge contest. I decided to use fruit that I could find fresh – pineapple, kiwifruit plus red and green grapes. If it had been summer, I would have used mostly berries. Use whatever fruit you like best; frozen fruit that has been thawed will work too. I couldn’t find store-bought crepes, so I had to make my own. I’ve provided the recipe I used below in case you find yourself in the same boat. My homemade crepes were already warm, so I skipped the step where you heat them in the microwave to make them pliable. My crepes were smaller than 9 inches, so I used Pyrex® custard cups for the molding step. They worked beautifully. I also used less fruit than the recipe calls for. If you’d like to win a copy of Baking for Friends, please see details on the giveaway below. If you don’t win, Tate’s is offering a discounted price on the book ($19.95 instead of $24.95). Just go to the Tate’s Bake Shop online store and enter the code BAKEOFF when you check out. Tate’s is also hosting a recipe contest on Facebook where you can win cash ($1,000) or a Kitchen Aid mixer! If you’re a baker, you’ll definitely want to check it out. 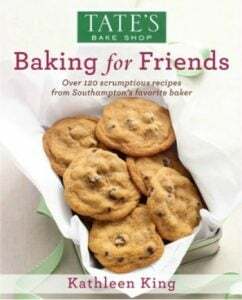 Disclaimer: I received a free copy of Baking for Friends by Kathleen King of Tate’s Bake Shop plus a second signed copy to give away. All opinions are my own. East Hampton High School students Peter Shilowich, Nicholas Quiroz, Jen Gomez, Brianna Loffreno and Luisa Torres created this prize-winning recipe for the Long Island Family & Consumer Sciences Healthy Snack Challenge. The challenge was to design a quickly prepared nutritional snack that was 200 calories or less. A beautiful fruit salad for one in a crepe bowl, it is named after the school’s football team, The Bonackers. Clever kids! Position an oven rack in the center of the over and preheat the oven to 350°F. Turn a 4-inch-wide ramekin or ovenproof bowl upside down, spray the bottom and sides with oil, and put on a baking sheet. Place the crepe between 2 moistened paper towels and microwave on high (100% power) until warm and pliable, about 15 seconds. Drape over the prepared ramekin and press gently, folding up the edges of the crepe to fit the shape of the ramekin. Bake until the crepe is crisp and lightly browned, 8 to 10 minutes. Let cool on the ramekin for 1 minute. Gently lift up the crepe bowl from the ramekin and put, flat side down, in a serving bowl. In a small bowl, combine the kiwi, strawberries, pineapple, blueberries and blackberries. 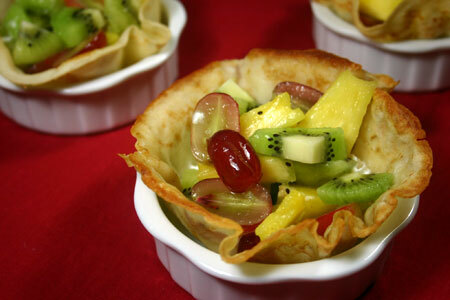 Add the topping to the crepe bowl and spoon in the fruit. Serve. Nutritional Analysis: This dessert is low in Saturated Fat, Cholesterol and Sodium. It is also a good source of Dietary Fiber, and a very good source of Vitamin C and Manganese. (Source: nutritiondata.com) If you want to reduce the carbs and sugar, use less fruit. If, like me, you couldn’t find pre-made crepes at your grocery store, here’s one recipe for making your own. These crepes have fewer calories and less cholesterol, sodium, carbs and sugar than store-bought. If you decide to make your own, take a deep breath and relax before you start. And accept that the first few won’t be perfect until you find your groove! Place all ingredients in food processor or blender and combine until smooth. Let batter rest for about 15 minutes. Place batter in a container with a pouring spout (a measuring cup works well). Heat a 6-inch nonstick skillet over medium-low heat. Briefly remove pan from heat and spray with cooking spray. (Don’t spray near the stove.) While pan is off the heat, pour in enough batter to barely cover the bottom of the pan and swirl to make perfectly round shape. Return to heat. Cook until edges look done and top is dry, about 2 minutes. Run a spatula around the edges of the crepe, making sure nothing is sticking. Turn your spatula upside-down and lift one side of the crepe. Use your other hand to help flip the crepe. Cook for about a minute on the second side, then slide the crepe out of the pan onto a plate. While pan is off the heat, spray with cooking spray and repeat process until all crepes have been cooked. I usually love baking cakes or cookies for my colleagues. This is such a clever dessert! I know the kids would love it too. So pretty! The healthy recipes sold me on this book, too. I like baking cakes for family and friends. One of my favorite dinners to make is pizza! I love making the dough from scratch and creating new pies from recipes online or just in my head. I made homemade Mac and Cheese last night and tomorrow night we are having Mac and Cheese Pizza, I can’t wait! The bowls make a beautiful presentation, and look so delicious! I like the crepes as they don’t overpower with sweetness, and let the fruit shine through. I love baking cookies for friends! So versatile and easy to transport! My favorite thing to bake for friends is cookies and banana bread :) Love the crepe bowl, what a fabulous idea! Looks very nice. It will be a great way to get more fresh fruit into even the pickiest eater, such as a child, I am thinking.